We will do our best to accommodate your busy schedule. Request an appointment today for new clients only! BOOK your appointment today EXISTING CLIENTS ONLY. Pet Emergency? Call us right away at 828-478-3500! From the first hello to the final farewell, our mission at Veterinary Specialties is to partner with you to provide the best quality of life, throughout the life of your pet. This mission goes far beyond the state-of-the-art medicine and surgery services we offer. Every aspect of each visit is designed to minimize stress and be pet-friendly. Each member of our healthcare team is committed to providing compassionate care and personal attention. Our goal is to have our patients be discharged not only in perfect health, but with their tails wagging and their motors running. If you live in Sherrills Ford or the surrounding area and need a trusted veterinarian to care for your pets – look no further. 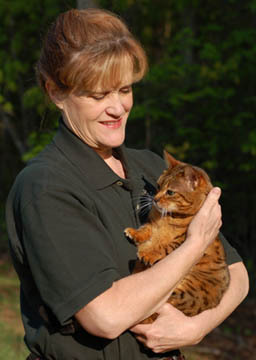 Jane Barber DVM, MS, DACT is a licensed NC veterinarian, treating all types of pets. Your pets’ health and wellbeing are very important to us, and we take every possible measure to give your animals the care they deserve. Veterinary Specialties at the lake is a full service, privately owned animal hospital that welcomes both emergency treatment cases as well as pet patients in need of routine medical, surgical, and dental care. Jane Barber DVM, MS, DACT has years of experience treating serious conditions and offering regular pet wellness care. Beyond first rate pet care, we make our clinic comfortable, kid-friendly, and calm, so your pet can relax in the waiting room and look forward to meeting our Sherrills Ford veterinarian. We are happy to offer a number of resources that enable you to learn about how to take better care of your pets. Please feel free to browse our site, particularly the informational articles. The best veterinary care for animals is ongoing nutrition and problem prevention, so becoming knowledgeable about preventative pet care is essential to the ongoing success of your animal’s health. If you have any questions, call 828-478-3500 or email us and we'll promptly get back to you. Our Sherrills Ford veterinarian office is very easy to get to -- and you can find directions on our Contact Us page! We also welcome you to subscribe to our newsletter, which is created especially for Sherrills Ford pet owners. At Veterinary Specialties at the Lake, we treat your pets like the valued family members they are. 15% off first office exam, including complimentary nail trim. Sign-up using the form or call us at 828-478-3500 to take advantage of this exclusive offer. "I know i can always trust every single employee! Jane and her staff are always so good to my fur babies and have become friends that I can count on at any time in emergencies or just regular visits my dogs are always treated amazing! Thank you vet specialties for loving my babies and always taking such great care of them!!" "5 stars is not enough! They have been our family vet for years now and are hands down the best. Treated our border collie the other day for toxicity. We did not think he would make it when we went in there but dr barber and staff saved his life! Couldn't be more grateful."